The Grenada Hotel, Villa, Apartment or Guesthouse you choose will have a huge impact on your stay in Grenada. Below I’ve assembled a mini Grenada Hotels and Accommodations guide to help you make the best choice based on your taste and affordability. Most Grenada hotels are located only minutes from the airport on the south west coast, next to the best Grenada beaches on the island. This also gives you great accessibility to the best restaurants and, the capital city of St. George. However, Grenada accommodations are not restricted to the south west coast, as many think. You will find a few off the beaten path gems in other parts of the islands. Visit the Interactive Grenada Map to find exactly where hotels are located and what’s nearby. Okay, let’s get started. There are too many Grenada Hotels, Villas, Apartments, etc for me to list them all here. So what I’ve done is pull together a list of those I have personally visited (to dine and hang out), and those that I heard very good things about. The list will grow with time. These will at least get you started. Any of one of the many Grenada Hotels or accommodations that did not make my list, may still be an excellent choice. There are many online resources you can use to pull up a full listing of Grenada Hotels, if you need to see more. Are you the kind of traveler who prefers to stay among the locals so you can truly experience the island the way they do? Then Olga’s gives you that opportunity and more. Olga’s is located in a scenic village very close to the National Stadium, the main town St. George’s, and several popular attractions. This quaint, affordable lodging, is perfect for couples, or the solo traveler. Click here to read more about Olga’s. A beautiful sanctuary nestled in the quiet residential neighbourhood of Lance Aux Epines in St.George’s. This spacious 3 bedroom house has everything you will need and it is in the heart of the one of the most vibrant parts of Grenada. With numerous dining options, easy access to transport round the clock and miles of white sandy beaches to choose from it’s hard to beat Spice Retreat for your Grenada Vacation. 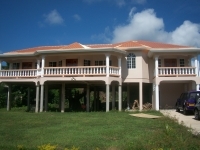 Click here to check out a more detailed overview of this Grenada Villa. From the daily sunrise, to the Atlantic Ocean views there’s no mistaking that you are on a Caribbean vacation in Grenada when you are at Sunrise Villa in Fort Jeudy. 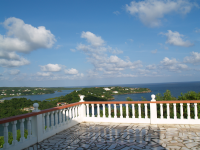 This Grenada villa has all the modern conveniences, an excellent location, and it boasts some of the most spectacular views. Grenada’s Hotels don’t work for everyone. Maybe you want more privacy, or maybe you are traveling in a larger group, if so then click here because this Grenada Villa might be just what you are looking for. Herons Flight is both attractive and affordable, it has many amenities and is close enough to the well known hot spots. There is no doubt that tourists are spoiled for choice when it comes to accommodation in Grenada, but here’s a thought, wouldn’t you want to stay in a lodging that is different from what you would find in other parts of the globe? Say, wooden Creole cottages painted with bright colors, with wrought iron finishes that allow for natural …. I am looking into St. George’s medical school and would like to ask you if you know of pet friendly (dog) housing in proximity of the school. Please advise. Any other advice about life Grenada would be greatly appreciated. thank you for the comment. I do not know of any dog friendly housing close to SGU. Maybe other readers can comment. Good Luck with your search and let us know if you find something you like. Thanks for the comment on Petite Anse… I’ve heard nothing but good things about that place so far, and plan to pay them a visit on my next trip. Hope you enjoyed other parts/ things about Grenada as well. I have to agree with Amanda. I had such an amazing time at Petite Anse. Philip and Annie are absolutely fantastic. They’ve been featured on Trip Adviser and for good reason =) Otherwise I am loving your website. It was extremely helpful when I was planning my trip to Grenada. Great website man. When I came across your website I thought you were a hotel owner and living in Grenada. Typical Caribbean thing eh having a pen/nick name too. If you were like me, it may have been one of your friends or parents who called you by that name then it just stuck. Mine’s cyphas. Having left the Caribbean over a decade now, the British weather here makes me appreciate that back home. It’s not your typical holiday hotel – It’s living the life some movie stars enjoy. The boat is great sport…for men -leaving the wife behind to enjoy herself at the spa. Thanks for the comment. I actually just a couple days ago had another guest recommend Windward at Prickly Bay. Sounds like you had a fantastic time, and I’m glad you enjoyed the site. I try to get home at least once a year, mostly for Xmas. Exploring the Caribbean will keep you young, so start soon. As you now know Grenada and all the other islands am sure have much to offer. One day I’ll make it back to Vincy. Owned by Philip and Annie Clift, it has the most breathtaking views over the Grenadine Islands. Their casual dress code means you don’t have to pack the entire wardrobe. Their chef Jamie is a treasure who makes EVERYTHING from scratch including sausages, a mouthwatering range of breads and many types of ice cream to name but a few. Most of the vegetables are actually grown in Philip and Annie’s garden which makes the hotel truly eco-friendly and macrobiotic to boot. They are Grenada’s No.1 hotel outside of St George’s area according to Trip Advisor and SERIOUSLY well deserve that fantastic accolade. Can anyone give me a review of Big Sky Lodge? Looking at their website the cabins, location and staff look very appealing, but I can’t find any reviews on it! Glad you liked the site. Have you tried Lance Aux Epines Cottages I know someone who always stay there and loves it.. It’s right on a beach and not too secluded, hopefully it’s within your budget. If you cannot find something right smack dab on the beach within your price range then consider looking at something that’s a *little* further out but easily accessible, Grenada is so small that you are almost always 10 – 15 drive to a beach front. Regardless I do hope you make it to Grenada February to escape the frigid winter and raving fans. And if you do please send me a couple pics or tell me what you liked best about Grenada. Jenny’s Place has come up a few times in conversation, and I have seen signs/adverts here and there but I honestly do not have any first hand information about it. If you do hear from Nick he might be able to give you more information. As for shore fishing, there are a few places you can still do that in the south of the island (most likely close to where you will be staying) even though that area is quite built up. The challenge is that you will need someone who knows the area to guide you. Fort juedy, true blue, lance aux pines, point salines, quarantine station, edgemont, … all of these areas have decent spots but you have to know how to find them. You can give my friend Adrian at Native Spirit Scuba (http://www.grenada-beaches.com/grenada-attractions/native-spirit-scuba/) a call and he can sort you out with regards to snorkeling and fishing. Hope this helps. Enjoy the trip in stay in touch. Thank you for the quick reply! BTW – Your website is great. Love all the photos and the details about great fun in Grenada. I had a friend tell me to also check out Jenny’s Place. Any feedback? The island looks like so much fun. My kids are way into snorkeling, so getting them off the beach will be a challenge. All of us love Rotis, so I enjoyed your article on them and we are looking forward to chowing down on a lot of them. The Friday Fish Fry is also high on my personal list. I am also interested in fishing while we are there. Do you know any good spots that I can fish from the shore or wade fish? I am also looking for local boat charters to try my hand at some offshore fishing. I hope that I am not throwing too many questions at you, it is just that we are excited about our trip and you have proven to be quite the expert. I also copied Nick Hughes from http://www.spiceislevillas.com, he is the man to talk to if you want to stay at a villa. If you do make it to Grenada please write back and let me know what you liked best. We have never visited the beautiful island of Grenada. We are a family of 4 with 2 kids (ages 7 and 8). Do you know of any villas/cottages we should consider? We would like to be beach front and be able to snorkel right off the beach. Look forward to your recommendations. what about the Grand View Inn? Borders both Morne Rouge and Grand Anse – every room has a view of one or the other. Stayed there for two weeks… loved every minute.